DJ rob worked at our wedding in Bali. He was awesome, he was in touch prior to the wedding with information about himself and asked for our song requests. As soon as the first dance took place we had all the guests on the dance floor dancing along to their requests and having a good time, even my granny 88 years of age up and dancing. thank you Rob for helping us have an unforgetable wedding. DJ Rob was the BEST DJ we could have chosen for our wedding in Bali. In the months leading up, we emailed DJ Rob numerous times and he was always quick to respond. He asked a few questions regarding the type of music we wanted for our wedding and we left the rest in his hands! On our wedding night and as soon as DJ Rob arrived, the party really started!! The music he played was spot-on and exactly what we wanted. We had old-school and new pop, dance, RNB and the party was wild. All our guests were up and dancing from the moment he arrived until the end of the night. He could tell the type of music our guests liked on the night and continued lifting the vibe. It could not have been a better party!! DJ Rob, thank you so much for an excellent performance at our wedding. You were one of the best decisions we made for our wedding, and you helped give us a party that our guests and we will never forget!! Highly recommended!! All communication with Rob was easy, knowledgable and fun, pretty much all done on whatsapp and Email. In fact we never spoke until the night of my wedding. We had a wedding party of 60 people going across 5 generations to whom were all music and party lovers. Our goal was to have majority of the party dancing the night away with us, which is exactly what happened. Rob did a great job of working our preferred recommendations, reading and adjusting to the crowd. He also used great intiiative to double check 2 key moment songs with me. As our dinner and speeches over-ran with our planner also disappearing most of the night(!! ), Bride & Groom we had no concept of time. Rob did a great job of using his initiative with flagging the time with MC & Bride which quickly promted our First Dance which then lead to the party levels going up a solid few notches ! We had an awesome night, Rob was a great influence of making that happen. Thank you! Hi Rob we just wanted to say a huge thanks for Saturday. It’s was an amazing night. Best day of our lives without a doubt. Thanks for everything. It’s been an absolute pleasure working with you in the lead up and night of our event and I had heaps of compliments on the choice of music. Some friends asked if they could buy the playlist haha! Thanks again. 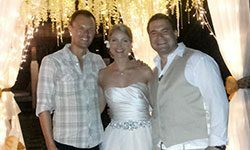 DJ Rob did a great job at all 3 of my wedding events in Bali. 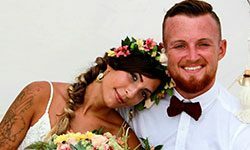 Having a multi-cultural wedding over the course of 4 days is a lot to ask of anyone but DJ Rob rose to the challenge – satisfying a mixed crowd of Indians and Australians which is not an easy task! Rob was able to read the crowd to ensure everyone got on the dance floor. He was professional and polite at every event. 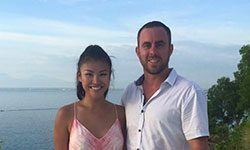 I would definitely recommend Rob to any couples getting married in Bali. Great dj and fantastic wedding. Rob played some excellent tunes and knew how to get the crowd going. He was very professional and friendly and takes great pride in his work. He also has a varied selection of music in different genres to cater for all tastes. Thank you so much! We just let Rob decide most of the play list and we didn’t have to worry at all. Sorry for the empty dance floor as everyone was cooling off in the pool. Never thought I’d be doing Gangnam Style at my wedding but it was hilarious! Excellent DJ! We thought the music on the night was really awesome, couldnt have had a better wedding really! Considering all the goings with everyone going completely crazy and jumping in the pool, I am guessing that all our guests enjoyed it as much as we did! I would def recommend you if I ever here of anyone getting married in Bali! What can I say Rob was unreal with the lead up to the wedding day he was so friendly and helpful and very easy to deal with! On the day of the wedding Rob and our MC got on like a house on fire which was so easy for me as them two ran the whole night and all I was left to do was to enjoy myself! The dance floor was not empty the entire night and that is all thanks to Rob! He was unreal and definitely knows how to work a crowd with such diverse age and styles of music! Rob made mine and my husband wedding a night to remember for all the right reason and for that I cannot thank you enough! We can’t thank you enough for your performance on our wedding night! 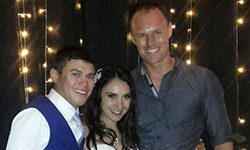 From the very beginning stages of planning our wedding, we knew that the most important component of the reception would be the music and we were dead set on choosing a person who would be able to keep our crazy friends up and dancing all night. As I am sure you noticed, you did not disappoint! Once dinner was finished and out of the way I don’t remember us leaving the dance floor for the rest of the night. Every song we requested was played and the songs you played on your own accord were right up our alley. We had so many guests come to us at the end of the night and tell us that our wedding was the best one they have ever been to and we think a large part of that feeling was due to the atmosphere you created with the music- I mean, even the resort staff got involved in a dance off at the end of the night. 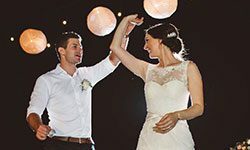 We would recommend your services to anyone who fancies spending their wedding night glued to the dance floor with their closest family and friends. Again, thank you so much from the bottom of our hearts for making our wedding night so memorable.